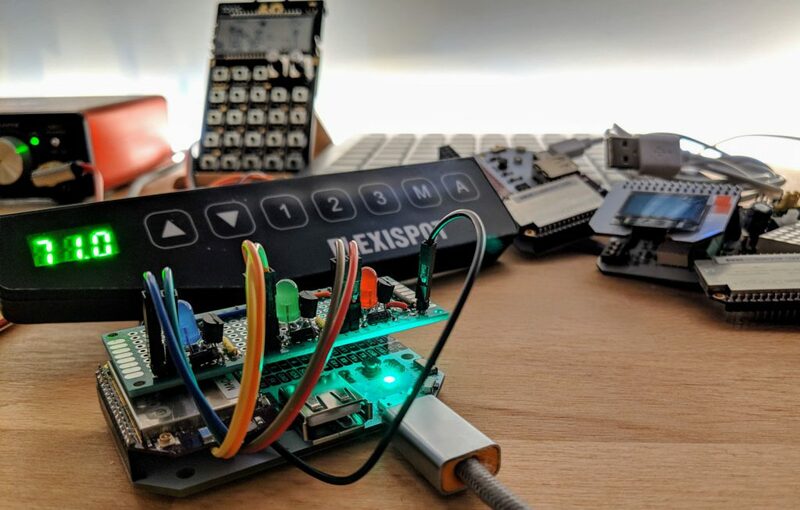 We have such a great project to share with you today featuring hardware hacking, clever software work, and integration with Google Assistant! This project demonstrates an alternative but equally effective method for connecting the Omega2 to Google Assistant as the recently featured pool pump project. Wassim Chengham wasn’t content using buttons to make his motorized FlexiSpot standing desk go up and down, so he used an Omega2 to hack the desk and connect it with Google Assistant. Now he can just ask Google Home to move the desk for him! Before connecting to Google Assistant, Wassim first needed a way to control the desk with his Omega. The first step was hacking the standing desk control board so that the Omega, along with a simple transistor circuit, can operate the control board using the GPIOs. Then came a Node.js program running on the Omega that created HTTP endpoints that would initiate a press of each of the buttons. Now the desk could be controlled with HTTP requests from the local network, but to connect it to Google Assistant, the HTTP endpoints would have to be publicly accessible from the internet. Wassim used ngrok to do just that, creating a public URL to expose the Omega’s standing desk HTTP endpoints to the internet. The final step was using IFTTT to connect Google Assistant to the API exposed on the ngrok URL. Then saying “Hey Google, rise my desk to level 3” would put everything into motion and raise the desk, without even moving a finger! The post also goes on to explain Google’s recommended way of using the Smart Home API to connect Google Assistant with hardware. Great work Wassim! Official Eagle hardware libraries for the whole Onion Omega2 IoT Computer family are now available!